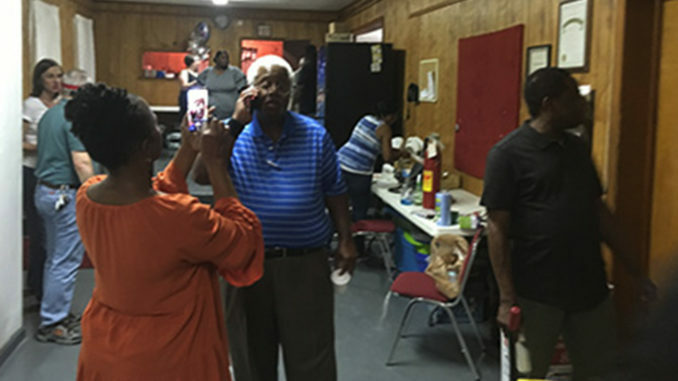 In a photo from a church member, Associate Pastor Goldy Wade is seen talking on a cell phone, and on a table at right is a fire extinguisher. The church was vandalized when a fire extinguisher was sprayed in the sanctuary. 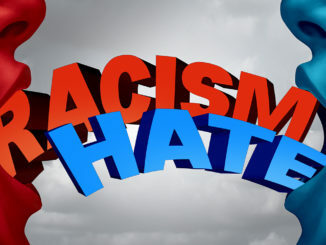 MURFREESBORO, TN — Four teenage boys were in custody Tuesday, accused by Rutherford County Sheriff’s deputies of vandalizing an African American church that was being cleaned by volunteers Wednesday evening. The Rev. Richard Sibert, pastor of Walnut Grove Missionary Baptist Church, 2480 Twin Oak Drive, prayed with one of the boys whose mother took him to the church that’s east by southeast of Oakland High School. 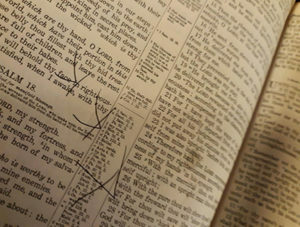 [/media-credit] Three letters were scrawled in the large Bible in the sanctuary of Walnut Grove Missionary Baptist Church. 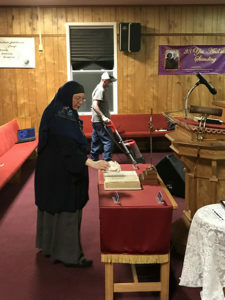 A woman looks at the vandalized Bible as a man cleans the carpet near a banner placed in the sanctuary to celebrate the 38 years served by the Rev. Richard Sibert at Walnut Grove Missionary Baptist Church. Photo courtesy of Rick Rodriguez, WGMBC Media Department on the doors of the predominantly African-American church. [/media-credit] A woman looks at the vandalized Bible as a man cleans the carpet near a banner placed in the sanctuary to celebrate the 38 years served by the Rev. Richard Sibert at Walnut Grove Missionary Baptist Church. Damage to the church was extensive, including overflowed toilets with water damage to the building. “They put sausages in it,” said Murfreesboro resident Jackie Davis, a Girl Scout leader. The church had a Sunday dinner there and the boys allegedly stuffed food down the toilet. Davis was told a pressure washer was needed. She took one to the church, but one had been brought so she stayed and was cleaning the bathroom after the plumbing was cleared. Tammy Harmon, a member of the Islamic Center of Murfreesboro and a Girl Scout leader, said “a sister Girl Scout told her about it on Facebook.” Her faith community and Girl Scouts went to the Baptist church to help remove the graffiti. “They came out to support us when we were vandalized and helped us clean our wall,” Harmon said. “There was an outdoor brick building to be cleaned with brushes and power wash.
[/media-credit] Jennifer Vannoy, a volunteer, is seen cleaning a wall in Walnut Grove Missionary Baptist Church. know what the words said. The Sheriff’s Department reported that with the help of citizens, Deputy Matthews developed two suspects and located the juveniles nearby. Those suspects, ages 14 and 16, are accused of burglary, theft and vandalism. A video camera that’s used to ljove-stream worship services on the Internet was stolen from church and found in the woods behind the church. 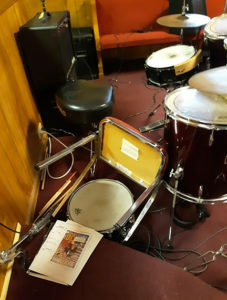 [/media-credit] A chair is turned over near drums in a church where vandalism could be considered a hate crime. Detective Jamin Humphress found two more boys, ages 15 and 16. Wednesday morning, they were accused of burglary and vandalism. Technically, juveniles are not arrested. They’re taken into custody and named in petitions to a juvenile court judge who’s ask to find them delinquent because of acts which, if committed by an adult, would be considered crimes. Sheriff Mike Fitzhugh said he’s pleased that the officers “quickly addressed these insensitive and disturbing hate crimes at a place of worship.” Humphress said he worked with a school resource officer to identify the two other juvenile suspects. The detective plans to speak with the District Attorney’s Office about additional charges. Sibert was asked if he thought a federal hate crime might be filed. 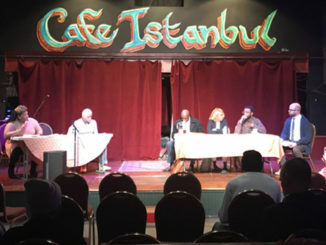 “I don’t know how they will approach it, but I know it has all the elements of a hate crime with that kind of graffiti,” Sibert said. Wade said he believes the crimes were committed between noon and 1:30 p.m. Tuesday. 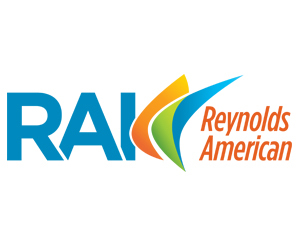 “I’m praying for the kids and hoping they know what’s been done and that there will be help for them and their parents to change their attitude,” the associate pastor said. 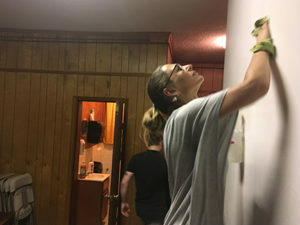 Angela Bingham, a Sunday school teacher who works with the Murfreesboro branch of the NAACP, said Renewed Life Ministries had members helping clean her church Wednesday night. “I would prefer them to have some in-house suspension and get some counseling,” the pastor said. “Going to the alternative school may be alright, but … [they might] … come out worse than when they went in because they learn the tricks of the trade. Bingham said one boy’s mother “made her son apologize tonight. She said she didn’t raise her son that way. That was admirable because he’s a teenager and you know a teen might say no,” Bingham said. The pastor was asked if the boy was repentant. “I think he was remorseful,” Sibert said. “He was tense at first and then relaxed when he found out we were not going to hurt him. 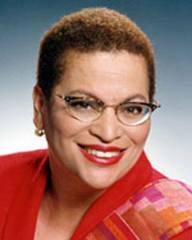 Bingham indicated that while delinquency was displayed, there’s opportunity for the boys. “It can be a great turnaround … for them to see that this is the wrong way to go,” she said. 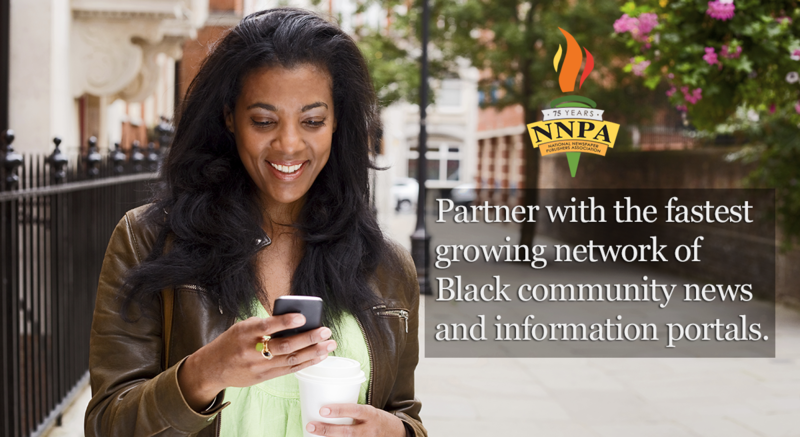 “If it changes their heart … they will see that all people matter and I’ll be so pleased. We were together tonight and praying for them.